Latest e-cigarette reviews from hundreds of real e-cig users and our editors to help you find the best e-cig starter kits (cig-a-like and rechargeable models) on the market. 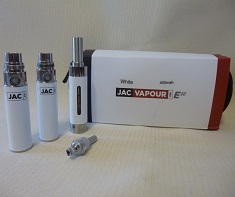 Electronic cigarette starter kits offer you everything you need to start vaping, making them perfect for new users. Our electronic cigarette reviews are based on extensive testing and are conducted by expert vapers, but you’ll also find hundreds of user ratings on this page to help you make your final decision. We’re dedicated to giving you a comprehensive overview of the pros and cons of each product in our reviews and comparisons, so you can make an informed choice and switch to the healthier alternative.